On Thursday 7th July 2005, while volunteering as Honorary Director of the Colong Foundation for Wilderness, the editor took a phone call at the Colong office from a Medlow Bath resident, who reported in that the Rural Fire Service had extensively graded the Six Foot Track in late June 2005. In the resident’s opinion the grading had occurred to such an extent that substantial damage had been caused to native flora, riparian zones and so warranted community reaction. That same day I contacted the legal manager of the Six Foot Track, Jon Guyver of the Lands Department, based at Orange and heard his view, learning that the grading was requested by the Rural Fire Service and authorised by the Trustee using grant funding from the Federal Department of Transport and Regional Services (DOTARS). I then phoned Greg Wardell, acting BM head of the Rural Fire Service to hear his view. In each case there is a strong sense of righteousness in the grading. The justification for the grading was to create a Primary Fire Trail, but this RFS action breached many of the conservation provisions of Six Foot Track Conservation and Management Plan 1997, including the Policy 7.2 (d). [Refer References below]. “Noticeable evidence of grading activity starts at a bend in the track NE of the words ‘SIX FOOT TRACK’ . There is the remains of a stone fireplace here, as well as bush and topsoil graded into the bush toward the creek. Between this site and the concrete bridge at Devils Hole Creek I counted 6 fresh mitre drains. Between Devils Hole Creek and the locked gate [Grid Ref 642458] passed the horse paddocks, I counted another 15 fresh mitre drains, before reaching Corral Creek. I didn’t continue west beyond Corral Creek. The disregard and disrespect for Aboriginal culture in the area appears to have been totally ignored/discounted. You are very right in bringing this issue to the attention of the public, stakeholders and authorities. 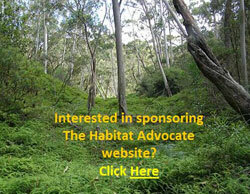 Your efforts deserve recognition by the Blue Mountains conservation community. A section of the road was rerouted. Extensive clearing has been undertaken. It does not appear that the Dept Lands is exempt from the provisions of the LEP when widening or re-locating a road. (a) demolish or alter the building or work; or …..
Did council give consent to the widening and re-location of the section of the Six Foot Track? If consent was given, was a heritage assessment undertaken? If no consent was given, what steps does council intend to take to penalise the land manager and/or to require restoration? The Society understands that Council has regulatory powers to enforce the NSW Protection of the Environment Operations Act. 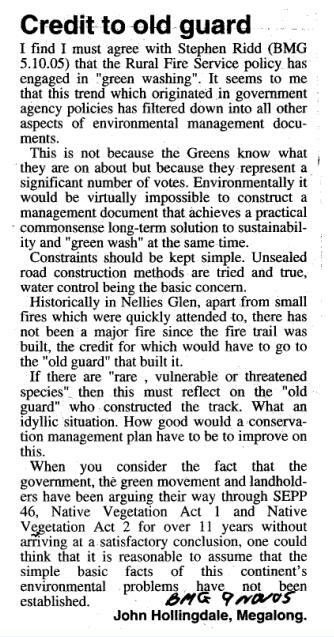 [written by editor and published in the Blue Mountains Gazette, 27th July 2005]. This is what a bulldozer can do midweek when nobody’s watching. This sad muddy bog left at the Corral Creek crossing is testament to the loose procedural controls of the bushfire committee. Such actions cannot help the RFS’ otherwise high community standing. 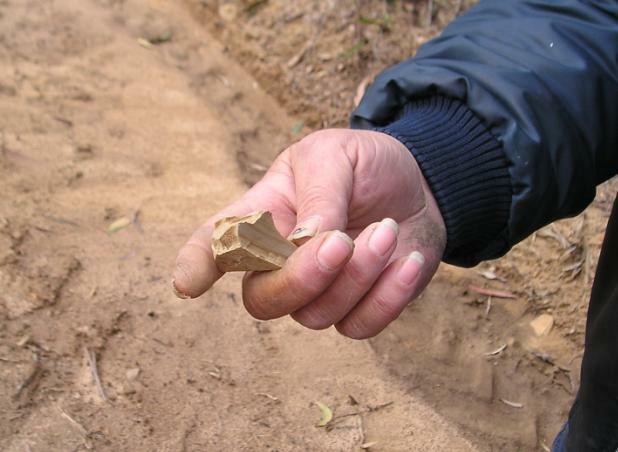 Aboriginal stone artifact found along the recently graded Six Foot Track July 2005. Following the publishing of my letter, correspondence from the Blue Mountains Conservation Society’s (ConSoc) Land Use Subcommittee, of which I was an active member, when silent. on Fairy Bower Reserve at Mount Piddington (and possibly other bush tracks we are yet to find out about). The minutes of the LUC August meeting indicated that ConSoc is to write to RFS “again”, so this suggest correspondence has already been made. I would appreciate any copies of correspondence please. What was the outcome (agreed actions) of the midweek meeting between ConSoc, >the RFS and trustee Jon Guyver back on or around 14 Jul 05? 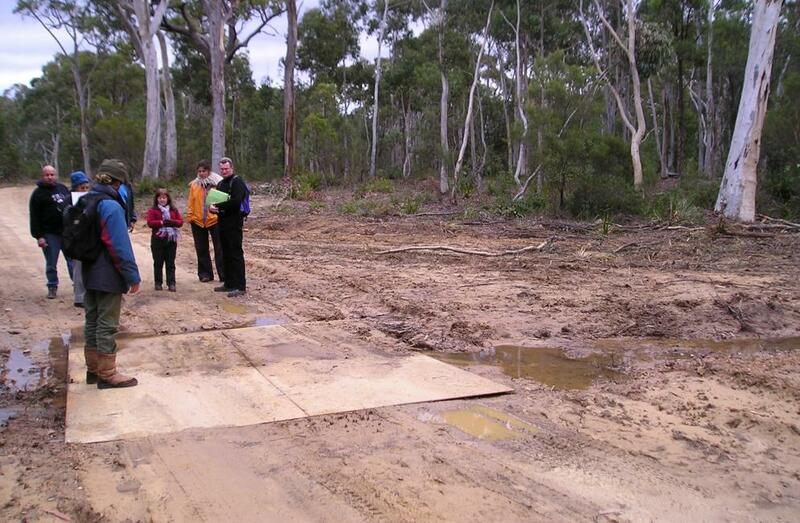 Has the RFS agreed to remediate the bulldozing of the SFT site with endemic plantings, sediment controls? Has the RFS or Jon Guyver been able to provide any minutes or correspondence regarding the decision making of the bushfire committee to authorise the bulldozing in June? “As per the previous LUC meeting on 13 Jul 05, I have enquired into the possible existence of a trust deed governing management and legal conditions concerning the control of the Six Foot Track. the NSW ‘Crown Lands Act 1989’ and ‘Crown Lands (General Reserves) By Law 2001’ as Reserve No. 1001056. Jon Guyver is the official administrator of the Six Foot Track Heritage Trust and he has provided me with a copy of the relevant sections of the Act, a complete set of the By laws applicable to the SFT and the Six Foot Track Conservation Management Plan Volumes I and II. The latter cost me $22. Lyn has indicated that she already has a copy of the Plan of Management – I assume this is the same. Volume I is 137 pages and Volume II is 142 pages. I am presently reading through Volume I.
intended to serve as a guide to conservation and management of the entire Track, but is not a statutory plan which is binding” (Vol. I, p 8). “All, Way back on 7-Jul-05, a call was made to the Colong Foundation advising that the Six Foot Track had been severely bulldozed near Megalong Creek. As a member based in Katoomba, I have followed this up, along with enquiries by other ConSoc LUC members. and legislation governing the Track. I am still yet to find out what actions others have taken. I am still yet to receive a response to my email below. 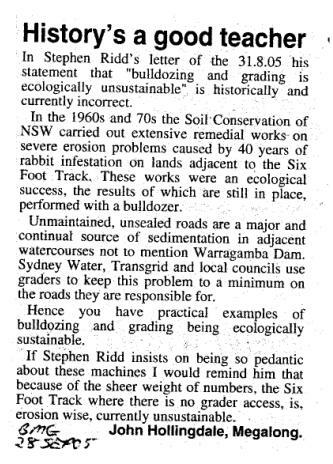 my letter of 27-Jul-05 alerting the Mountains community to inappropriate destruction of native habitat and important heritage values of the Six Foot Track [the editor changed my heading]. The thrust of my message was to try to highlight the cause of the problem in an effort to prevent it re-occurring. I referred to the “loose procedural controls of the bushfire committee.” Last week, three mixed response letters arrived, one targeting the contractor, but all ignoring the problem source – the actions of the bushfire committee. Still no public statement has come from the RFS, despite this public call for accountability. I note that ConSoc’s latest Hut News (Aug-05, p3) contains a useful account of the “informative gathering” on 21-Jul-05 by representatives of various stakeholder organisations agreeing on the need for rehabilitation work. But what is still unaccounted for are the actions of the bushfire committee. Is this bushfire committee made up of these same representatives? attached spreadsheet that lists the following ‘Fire Trails’ in the Blue Mountains for targeting as well as another undisclosed areas of the Blue Mountains National Park. Question is, have all these locations been subjected to similar bulldozing that we don’t know about yet? The Six Foot Track bulldozing is a drop in the ocean. The RFS Bushfire Assessment Code refers to complying with the >principles of Ecologically Sustainable Development, which seems nothing more than greenwashing. Blue Mountains NP 12 km $45,000.00. “Fire trails are important resources in the facilitation of prevention and mitigation works. An effective fire trail network increases options available in implementing hazard reduction to protect communities and their social, cultural, environmental and economic assets. In September 2004 the Prime Minister announced the allocation of $15 million for a Bushfire Mitigation Programme, over three years, for the construction, maintenance and signage of fire trail networks to assist local communities to better prepare for bushfires. Type of resources that can safely be made available to a fire suppression effort. [Published by the editor in the Blue Mountains Gazette, 31st August 2005, page 12]. The June bulldozing or grading of the Six Foot Track near Megalong Creek was not only wrong, unnecessary and excessive; it breached the statutory provisions of the Crown Lands Act 1989 under Crown Lands (General Reserves) Bylaw 2001, which prescribes rules for the Track’s environmental protection, heritage and public recreation. (2) To seek to recover and retain the Track’s original character by the preservation and restoration of identified sites and Track features. The Six Foot Track Conservation and Management Plan 1997, Vol II lists numerous vulnerable species of fauna recorded near Megalong Creek – the Glossy Black-Cockatoo (Clyptorhynchus lathami), Giant Burrowing Frog (Heleioporus australiacus), Spotted-tailed Quoll (Dasyurus maculatus). The RFS contractors wouldn’t have had a clue if they were within 100 metres or 1 metre of rare, vulnerable or threatened species. The critical value of dedicated RFS volunteer fire-fighters fighting fires is without question. What deserves questioning is the unsustainable response of the RFS ‘old guard’ to fire trails and hazard reduction with token regard for sensitive habitat. Repeated bushfire research confirms that bushfires are mostly now caused by arson and that the prevalence of property damage is a result of more residential communities encroaching upon bushland. Following the above publicity and the on site survey of the grading damage by Andrew Scott on behalf of the trustee (Department of Lands -Soil Conservation Service), soil remediation of the Six Foot Track was carried out later in 2005 at a taxpayer cost estimated at $27,000. The RFS has continued to contract out its grading of thousands of kilometres of fire trails across New South Wales, federally funded by the Department of Transport and Regional Services (DOTARS). In 2008, DOTARS ceased online publishing the details of its funded fire trails activities. The Blue Mountains Conservation Society Land Use Subcommittee (LUC) effectively ostracised the editor from all LUC meeting notifications, minutes and communications despite the editor emailing repeated requests for inclusion (all records remain on file). The logical conclusion drawn from this action is that due to the involvement by key influential members of ConSoc with the local Rural Fire Service and Blue Mountains Council’s Blue Mountains Bushfire Management Committee a conflict of interest existed in which the vested interest of the latter held sway. The Land Use Officer subsequently joined Blue Mountains Council. The editor (as Honorary Director) was also reprimanded by the Director of the Colong Foundation for Wilderness for taking a principled stand against ConSoc’s condoning of damaging bushfire management practices. This issue has become a regrettable chapter in one’s exposure to questionable principles of the NSW conservation movement. On 19th January 2009, on principle the editor resigned from both ConSoc and the Colong Foundation for Wilderness to embark on designing an independent voice in The Habitat Advocate website. In November 2010, the editor renewed his membership with the Colong Foundation for Wilderness. This entry was posted on Monday, December 20th, 2010	and is filed under Blue Mountains (AU), Threats from Bushfire.